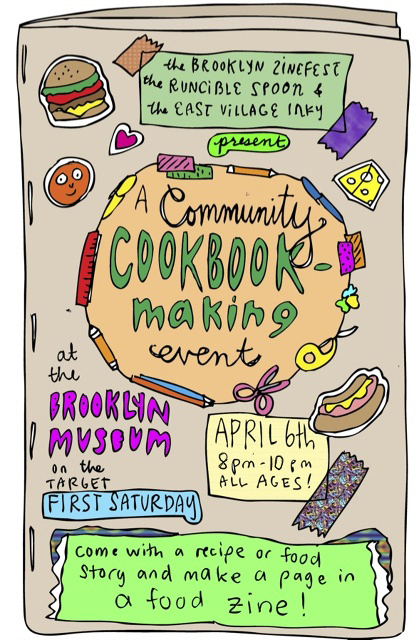 ..we’ll be putting together a community-sourced food & cookbook zine as part of the Brooklyn Museum‘s First Saturdays. From 8 pm to 10 pm in the Cantor Auditorium on the 3rd Floor, you’ll be able to stop by and share your favorite family recipe, the tale of your most amazing food experience, write about the worst thing you ever ate, or anything else food-related! Start brainstorming your recipes and food tales now, and get ready to either write them out on our page templates at the event, or bring them printed out in half-page (5×5″ wide by 8.5″ tall) format. For more info, see The Runcible Spoon‘s latest post. We’ll have tons of foodie collage and decorating materials available to customize your page, and the finished zine will be available on the Museum’s site a few weeks later. Also presented by The East Village Inky and I Love Bad Movies, this is a pre-zine fest event too delicious to miss! Having just returned from my first trip to New York City and Brooklyn, I am imagining this workshop will produce pages of heirloom bagel recipes, pizza crust tips from the old country, and the secret to keeping your plantains from getting rock-hard and inedible instead of mushy and delicious. If you are within the area at all, you’d be smart to head over!